Yeşim Yerli graduated from Bosporus University Engineering Department as an Industrial Engineer and obtained master’s degree in International Marketing Management (MSc) from University of Leeds, UK. With about 16 years of business experience as a marketing leader at several FMCG companies, she led various teams and created and developed many global and nationwide well-known brands. She believes that creative process is valid in every area of our lives and is not a product of circumstances but is the product of leadership skills. With that belief and interest in mind she took profound coaching, leadership and creativity trainings and finally quitted from Marketing Directorate position at Koton (Turkey’s Leading Fashion Retail Company) to share her knowledge and experience as a Coach. Yesim Yerli completed Co-Active Coaching Core Curriculum and Co-Active Coaching Certification Program from Coaches Training Institute (CTI) which are International Coach Federation (ICF) approved trainings. She enriched her coaching with various trainings such Organizational Relationship Systems Coaching (ORSC) at Center for Right Relationship, which enables her to coach teams in the organizations. In addition to coaching trainings, she took Co-Active Leadership in Spain, which is a 10-Month long, profound and a very experiential leadership training given by CTI. Overall, she took 543 hours of ICF accredited coaching trainings. 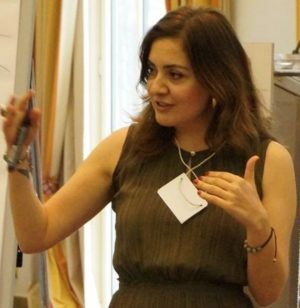 Yesim Yerli is a member of International Coach Federation and is a PCC (Professional Certified Coach). BRAND MANAGEMENT AT SEVERAL FMCG COMPANIES 2000-2007.